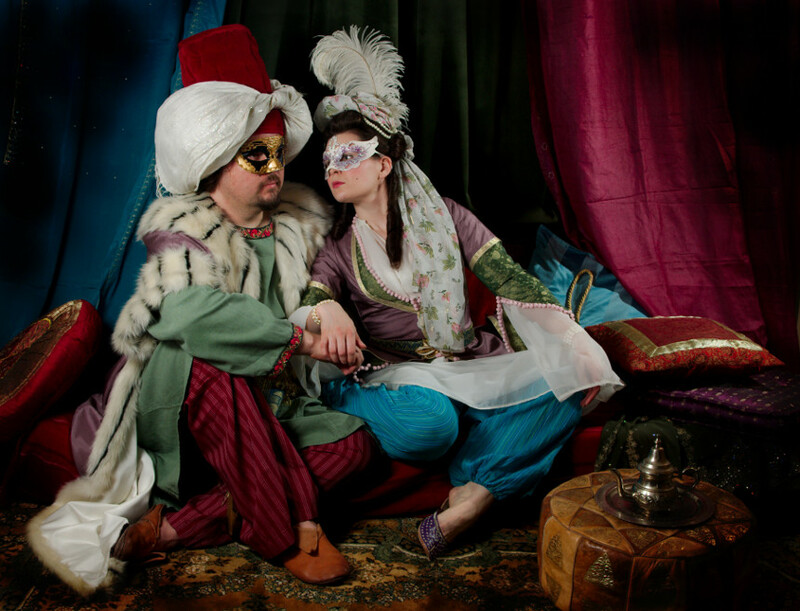 L'Amusette's annual masked ball had a "Orientale"-theme this year, very fashionable on the period. The theme encouraged making new exotic costumes, or rather was a good excuse to do so. 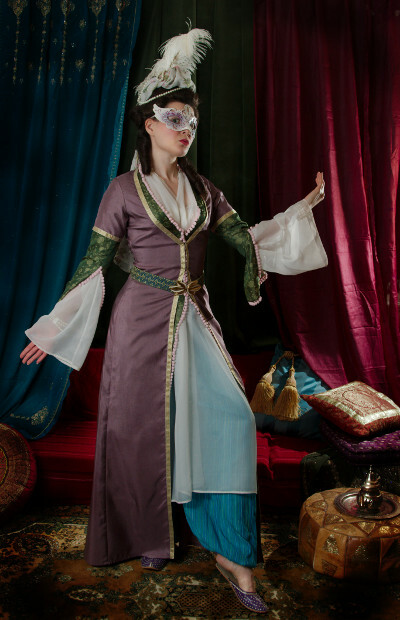 At first I considered the obvious choise of making some sort of a Robe a'la Turque, perhaps one that I could wear over my Chemise a'la Reine, but it's not one of my favorite styles so I could never really muster enough enthusiasm to make it. Meanwhile my first plan for Jarno was a Banyan worn with his regular 18th century stuff, but a google search gave me all sorts of outlandish ideas instead. 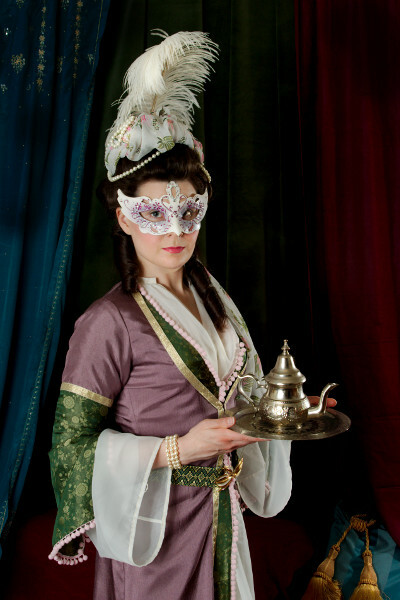 I realized that Jarno would look great in a full Sultan-esque Turkish costume, and actually the female costumes of the period looked kinda interesting too. Well, of course this was the kind of "wear it just once"-idea that I'm trying to avoid nowadays with the limited storage space in our apartment, but it was just too tempting. I could also perhaps give myself leave to make these outfits quick and dirty, with machine sewing and crappy, mostly repurposed or stash materials. Jarno's costume was mostly inspired by Antoine de Favray's portraits of European men in Turkish dress. 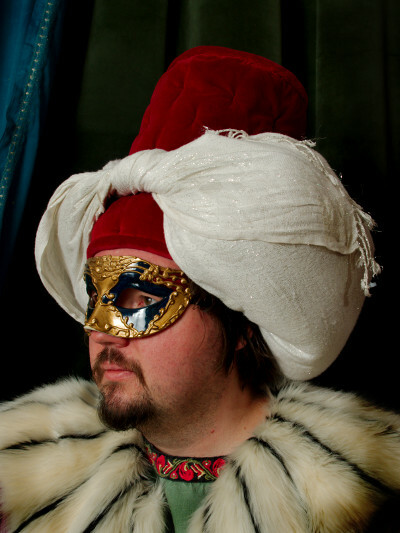 The most striking elements in the outfit are the luxurious, regal satin robe trimmed and lined with fur and the high fez-type headdress with a turban wrapped around it. 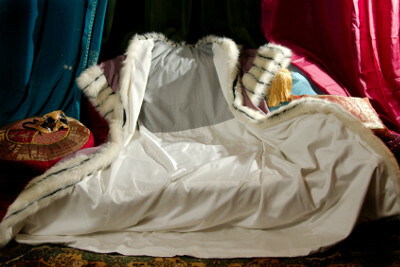 A perfect reconstruction of the magnificent robe with the fur lining would be too heavy and warm to wear, not to mention expensive. I wanted to keep the fur collar and trim on the sleeves and front edges however, but settled for a fake fur. In the end I even chose a blatantly fake looking, totally ridiculous striped fur, which doesn't even resemble any real animal (with the only exception of a few dozens of perfectly identical English Butterfly rabbits perhaps). Anyway, I sort of reasoned that it it would in some crazy way work in the carnevalistic fancy dress-context. As I wanted to make things fast and easy, I used a readily available robe pattern with a shaped raglan sleeve and a two-piece sleeve. I thought it would make figuring out the pattern for the collar easy (which it did), but it made the sleeve appear way too fitted, which I should really have anticipated. A simple T-shaped cut would have been more correct, but I realized this only after having cut the lining. I had lots of lightweight purple polyester taffeta in the stash, as it had been dirt cheap in some clearance sale ages ago. I had used the same fabric in blue for some of my early projects (Like this cloak), but felt it was too obviously polyester for any more serious costuming. This would be the perfect project to get rid of some of it. Of course I asked Jarno beforehand if he was volunteer to wear purple. The taffeta was so lightweight that it would need some kind of interlining to look even remotely like silk satin lined with fur. I had a bargain bin piece of cream satin for the lining, but it wouldn't be enough for the whole robe anyway. I salvaged an old double bed sheet worn threadbare in the center, cut it up and pieced the interlining from the edges that were still usable, reasoning that the satin would support the more fragile parts. I also had to do some serious piecing with the satin, but I managed to get a satin lining in the fronts and the back hem almost up to the armhole. The upper back and the sleeves were cut from a grey thrift store curtain, as they don't really show when the robe is on. The cotton sheet interlining was some extra work, but gives the robe a nice, heavier drape. The fur took up most of the budget and also, not unsurprisingly, was the most annoying part of the sewing. On the front edges the fur pulled the lightweight taffeta no matter how carefully I pinned it. At the shop the stripey fur had looked funny, but it was not so much fun to draft a pattern, cut and sew about twenty individual pieces of fake fur with a stripe in the center of each one. The fake fur was quite manageable to assemble with overlock, but no matter how careful I thought I had been with cutting and sewing the collar did not match the pattern in the end. Happily it was too large rather than otherways, so at the back it was easy to leave on piece out. The slightly shaped shoulder seam was a bit more tricky. 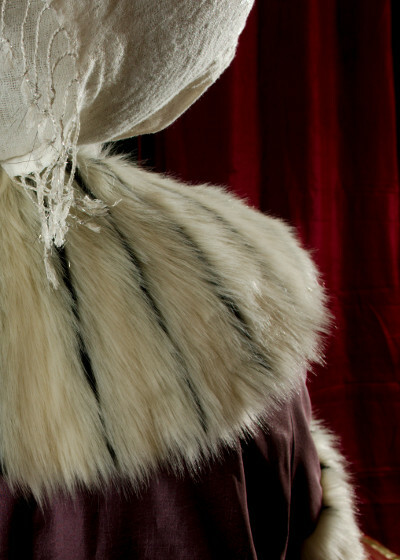 The knit-based fake fur also pulled to one side so at the center back the stripes are not quite vertical. In the end I managed to get a reasonably right shaped collar to fit the rest of the robe. I bag lined the robe with machine, adding a tape in the neckline seam to prevent the weight of the garment from stretching it shapeless. I did a little bit of handsewing on the inside of the fur trim on the front edges to get them fold neatly, though. 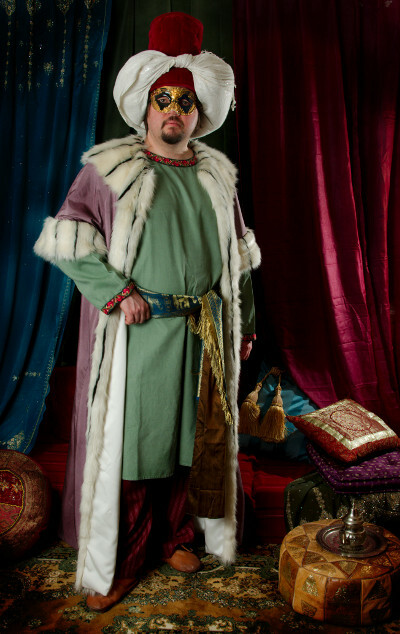 I didn't feel like spending the time or money on a proper turkish tunic, so poor Jarno had to make do with one of his 14th century linen tunics instead. It doesn't look that much wrong with the striped fur, anyway. I had also made him striped pajamas pants for Christmas with this outfit in mind. For the fez I made a base for the wall piece of two layers of felt with four vertical cable tie bones. Next I added a layer of wadding that came from an old bedding and finally a top layer of red velvet I happened to have in the stash. I had beforehand basted vertical lines on the velvet piece at regular intervals, and sewed a few stitches through all the layers to create a chesterfield sofa-like surface like in Favray's portraits, though in a larger scale to save time. The top piece is made the same way. Then I combined the two, which was a bit tricky to do by machine, and finally finished the seam with a bias cut velvet tape. The final result is none too neat, it would no doubt look nicer if I had worked more by hand, but I had decided not to put too much time on this project so I had to make sacrifices with the quality too. After finishing the fez I completed the headdress by stuffing a scarf with wadding and wrapping it around the fez, securing it with pins. 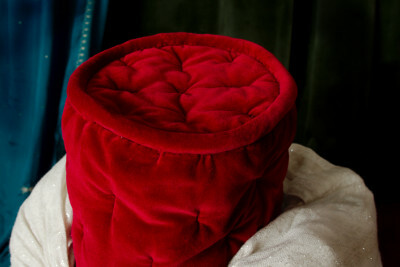 It ended up huge and quite heavy, but them every good fancy dress costume needs a a funny oversized hat, right? L'amusette named this thing "Überfez". 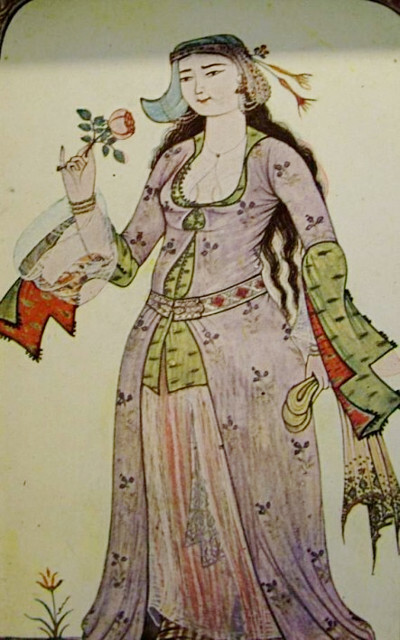 Pictures of the female Turkish dress of the period, both the real thing and the European "inspired by"-versions can be found plenty at my favorite blog, Demodecouture. There were many possible options for my outfit. Following what I had done with Jarno's costume I decided on an outfit based on female costume as depicted on the miniatures of Kadni Levni, rather than some sort of heavily europeanised outfit. It would be done in a rather relaxed attitude towards accuracy, sort of in the spirit of picking oriental elements for fancy dress use but with a modern approach to the construction and even aesthetics. Kadni Levni's ladies wear loose, often striped pants, a very sheer, long shift or shirt, and two jacket-like garments, one reaching mid-thigh with long, flounced sleeves, and the top one floor length with short sleeves. European ladies who dressed up "a'la Turque" for portraits seemed mostly to wear a petticoat instead of pants, though some brave individuals are panted in pants as well. Then they generally wear some version of one or two jackets, sometimes with wrap front, often fur trimmed. I began with the shift. I Kadni Levni's pictures it's almost transparent, so I used a blatantly polyester voile curtain to get the sheer look while avoiding the cost of silk. In some of the pictures you can make out the neckline being close to neck with a long front opening. In the European portraits the ladies usually have some sort of voluminous shift to fill the front of the generously curved jacket at the bosom, so I cut a wide high neckline and gathered it into a narrow band to get the same effect. I left the neckband a bit short to leave it open at the throat. I sewed the sleeve seams and size seams as french seams, but the shoulder area and underarm gussets are made with modern and quick finish as they are covered by outer garments. All the hemming is done with narrow zig zag with golden thread in hopes it might pass for some kind of decorative hand stitch. 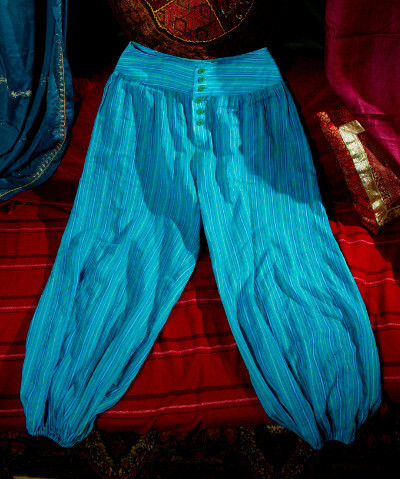 The pants also used to be a curtain of lovely light cotton with a tiny stripe of aquamarine, white, lime and ink blue. I liked the material so much I took some extra effort with the pants to ensure they would also have future use in real life. The pattern is based on a pajamas bottom pattern, cut wider to get the most out of the fabric width, to which I added a wide shaped waistband with buttoned front instead of just elastic waistband to get a smoother waistline more flattering to modern eye. The pants were easy and fun to make, and are very comfy and cute. I think they will get to be worn more in the summertime. What's more, I still have the other curtain of the pair for a dress to follow. 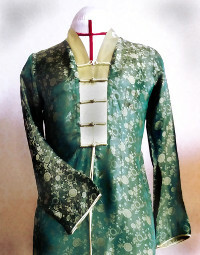 My shorter jacket is made from a pseudo-silk Chinese inspired robe found from UFF second hand. 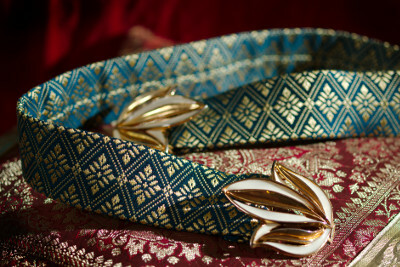 It had a nice exotique jaquard pattern and happened to fit me perfectly. The warm green tone was not quite my color, but would do for fancy dress occasion. First I got rid of the lime green front closure piece. I had thought I would have to add a bit material to replace it to get the front edges meet, but as they really only have to meet at the waist I was able to get enough additional width by simply opening the front waist darts. I curved the front edge sharply out below the waist again, and though the fabric pulls a bit at the waist this works well enough. The original garment had long side slits reaching up to the waist. When I closed these the front edges opened quite wide at the bottom due to my wide hips, but then they showed more of the lovely sheer shift and the pants, so it didn't look that bad on the whole. I also shaped the final line of the top of the front edges on the fitting. In Kadni Levni's pictures the open sleeves have a very interesting shape, which I haven't seen in the European portraists (I admit I haven't seen that many of them, though). 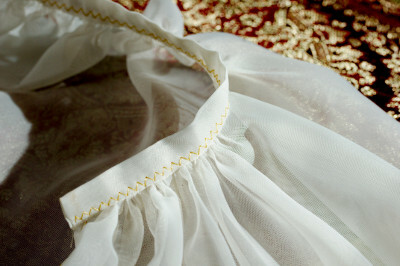 The European costumes seem to have simply a long, narrow sleeve with the seam opened up to the elbow. This would be super easy to make so I decided to be happy with that. I finished the sleeves similarly to the other edges: neatened them with overlock, then turned the edge under and covered it with a super-cute pink pom-pom tape. The decorative pom-pom-tape also doubled as a buttoning, when I sewed a looped band on the other front edge. The loops are too large for the tiny pompoms, but when I buttoned them by two's it somehow worked, especially after I added a securing hook and eye on the top of the buttoning where it takes most strain. The green jacket was so cute that with the ball weekend approaching fast I nearly gave up making the top jacket altogether. At this stage I also made the decision to leave the green jacket a bit longer than the ones worn with a top layer so that it would work better alone. But then I tried all the garments on together, and realized that with the printed chiffon piece I had found for a turban headdress (and which I had thought would fit brilliantly into the color scheme) everything just blended boringly into a pink/green sameness and the aquamarine pants didn't fit in. Added to that, I was a bit jealous of Jarno's opulent purple robe. So, I decided to scratch together a top jacket after all. According to portraits European women favored the fur-trimmed robe too in their Turkish costumes, but I didn't want to have anything to do with the fake fur at this point, and flimsy materials on my outfit would also create a nice contrast with Jarno's heavier, more masculine garments. A light, unlined jacket would also be quick and easy to make. The cut is based on my 14th century kirtle pattern, a shaped four piece garment with a guaranteed slevehead fit. I just changed the neckline shape and flared the skirts to the estimated width that would look right. This cut had probably just about nothing to do with real 18th century Turkish garments, but it gives a flattering, fitted shape. I made the side- and center back seams as french seams, but the sleeve and shoulders seams allowances are finished with overlock. The front edges and sleeve ends are finished with a machine sewn decorative band, and the hem is shocking done with machine stitch. With this top layer the green jacket hem is barely visible, and I could have fixed this by shortening it more and using the extra material to make gores on the side seams, but was at this point too lazy to do so. I'm really happy I finally made the purple jacket, however, it gives a nice contrast to the other colors and binds it to Jarno's outfit. As mentioned above, the purple taffeta came from the overflowing stash, but the green underlayer on both of us was more of a coincidence. Anyway, the result of matching outfits is kinda cute, as we like so different colors we are seldom seen in co-ordinating color scheme. And yes, my outfit picks the colors from one Kadni Levni miniature as well. One more thing needed was a belt. The portraits usually show a wide belt with a symmetrical two-piece buckle, round in the European portraits, square in Kadni Levni's miniatures. Of course I couldn't find either (at least for a reasonable prize). In the end I resorted to an UFF second hand sale belt, not quite right but with the tempting cost of 1€. I got rid of the original elastic band and replaced it with a base of several layers of spare fabric stitched together covered with the remains of the brocade I had used to edge one of Jarno's medieval tunics. The decorative edge of the same fabric went into Jarno's sash. 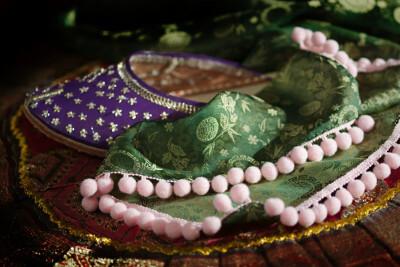 People today tend to wear contemporary make up and hairstyles with the most exotic fancy dress costume, and 18th century people were no different. I wanted to keep the idea of a fashionable 18th century lady dressing up in a risque Turkish costume (with pants and no stays, just imagine! ), so I kept a fashionable make up with pink cheeks and lips, and a high hairstyle with a turban-esque piece of fabric wrapped at the top. For some reason ladies seemed to wear a lot of pearls with Turkish-esque costume, so I added a string of pearls on my hair and wore my pearl bracelets. The mask is very modern, but as it fitted the color scheme nicely I picked it from my collection. I'd like to thank Petri and Hanna for the additional photoshoot props!